Her name popped out to me a couple weeks ago while I was covering a girls' soccer game. 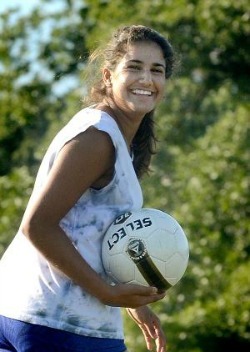 I hadn't heard of Azin Sabet, a senior playing for Dallastown this fall. And the name certainly stood out, just for the mere fact that it sounds different than most area names. So I followed up with Dallastown first-year coach Morgan Mickley. "Who in the world is Azin Sabet?" I asked. "She's a foreign-exchange student from Norway," Mickley said. Like many other schools in York County, Dallastown has had foreign-exchange students playing sports in the past. So what makes Sabet any different? And why is it any wonder that someone from a European country, where soccer is perhaps the most popular sport, hasn't skipped a beat on the field for the Wildcats? Little did I know how much of a surprise it would be in finding out the answers to those questions last week when chatting with Sabet after practice. "I'm not used to the humidity at all being from Norway," Sabet said. "It's really cold in Norway." For that very reason, the sport we Americans call soccer and the rest of the world calls fútbol is only the second-most popular sport in Norway -- behind skiing. It's also why Sabet had a tough time in tryouts last month. "Tryout week was the hardest. Running up hills in this weather ... it was a lot hotter (in August). It's just so unusual," she said. Still, Sabet wowed Mickley enough to earn a roster spot. "She's known for her wicked shot. The girls are always amazed at her shot," Mickley said. "She can be right in front of the goal and some girls just pass it in but her shot is always a rocket." Even more impressive than earning a spot on the varsity squad for a traditionally strong Dallastown program is when Sabet, a tall forward with long black hair and tan skin, tells you she hasn't played soccer in nearly six years. "I first played soccer when I was 8 years old and I played for two or three years. I enjoyed it a lot and then I started to do cheerleading at the same time because I wanted to do something new," she said. "I got to a level where doing cheerleading and soccer was just too much for me." Sabet, who has a twin brother and a younger brother who is 7 years old, speaks nearly perfect English, a language students in Norway begin to learn in the sixth grade. That and her bubbly personality have helped her adjust to a new life in a different country. Plus, Sabet said she's visited all seven continents in her life through cheerleading competitions and family vacations. However, she admits her experience at Dallastown hasn't all been easy. "It's really different and I was afraid of not finding friends and not fitting in," Sabet said. "And I'm not gonna lie. It's been a struggle to adapt to new cultures and a new country." One of the top players off the bench for the Wildcats, Sabet got the first score of her career two weeks ago. The goal, coming with 10:57 left in the first half on Sept. 11 at rival Red Lion, proved to be the game-winning score in a 3-2 win. "It was a really good feeling," Sabet said. "The level (of play) here is really huge. People here are really good at soccer." Read the original article at yorkdispatch.com here.